A couple of months back Ursula Frederick asked me if I'd be interested in contributing to a volume of the Journal of Australian Studies, guest edited by her and Kylie Message (both of ANU), on the theme of Media and Materiality. To cut a long story short, the theme is about how studies of material culture intersect with cultural studies. It's a teensy bit postmodern for me (sorry, Urs! 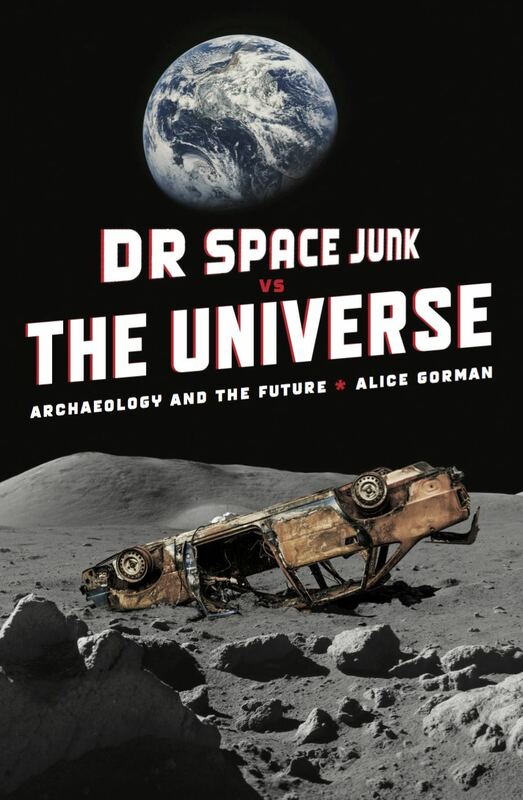 ), but Dr Space Junk is nothing if not versatile, or so I like to think. Ursula thought I might like to write about Skylab, and she was right. I have quietly been filing away bits and pieces about it with the intention of doing something with them, so here is the spur. Despite this, coming up with a coherent abstract to fit the theme of the volume was harder than I thought. Here it is as sent to Ursula; as usual the actual paper will probably evolve a bit as I get into the research and writing of it. The sky is falling: how Skylab became an Australian icon. In 1979, the US orbital space station Skylab made a spectacular re-entry that was widely anticipated across the world. As it disintegrated, debris from the spacecraft fell around the town of Esperance in Western Australia and were scattered over the arid inland. Like the de-orbiting of Mir in 2001, Skylab’s re-entry caused a media frenzy. Skylab is perhaps remembered more for this than for its actual mission, which was far less dramatic than the preceding Apollo program. 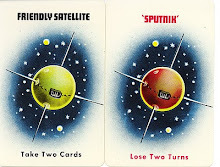 It was not even the first space station, as the USSR’s first Salyut had been launched two years before Skylab in 1971. Skylab’s main purpose was to investigate physiological, social and practical aspects of how humans could survive in space. For the first time, thought was given to the comforts of astronauts and the spacecraft was designed to be a home. This faraway house could only be seen by those who made the effort to look up when it was passing; like all orbital material, it was largely invisible, its presence felt only through media reports. In its reentry, however, the disembodied spacecraft became tangible, visible, and collectable, in the form of its scattered, and charred remains, in a way it had never been before. These pieces were collected, curated, displayed and marvelled over in small and large museums and in private collections. Anyone could own a piece of space if they were lucky; the debris was both space junk and precious artefact. 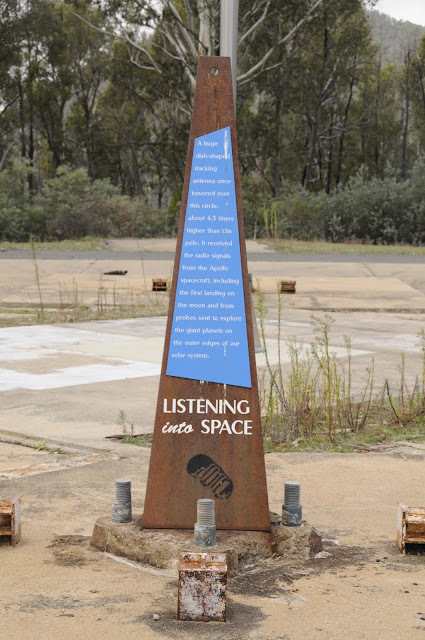 When the Shire of Esperance, tongue-in-cheek, fined the US Government for littering, Australia had made a statement about the relationship between spacefaring and non-spacefaring states, and the nature of space industry: being in space did not remove more terrestrial responsibilities. Through these local and personal interventions after its decay, the social significance of this house in the sky came to outweigh its historic significance. In this paper I consider how the parts of Skylab became more than the sum of its whole. Thoughts, leads, information, all welcome! I know I wrote a while ago that I was over remote sensing, but looking at a wonderful picture by CNES this morning of the Tango satellite as seen from the Mango satellite (if I remember the details correctly) I think I may have been too hasty. It would be possible to do an archaeological survey of orbital space remotely from another spacecraft in orbit. Or many spacecraft in orbit. Sampling would be critical to get across, as the distances are just so vast, but that's a minor problem, I think. Terrestrial tracking could be recast as a kind of archaeological survey - they're just not aware that that is what they're doing yet! Anyway this is more of a note to myself to remind me to come back to this idea. I have ten minutes before I leave for work, and this morning's task of delivering a masterclass to the graduates on conference networking. This afternoon the graduates are doing presentations on their industry work placements, there will be drinks, and if I don't imprison this thought in words now I might forget it in the awful rush of end-of-semester stuff. Wouldn't some wealthy aerospace company like to give me job researching this kind of thing? It would make me so happy. OK. Going to catch the bus now, in the rain. Space food: recreating an authentic space experience on Earth. A review of The Astronaut's Cookbook. 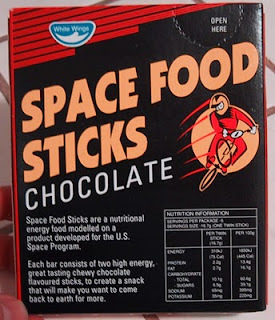 I've had an ongoing interest in Space Food Sticks, which have quietly vanished from Australian supermarket shelves in the last few years, despite the fact that they seemed to have a healthy export market in the US. So when I learnt of Springer's recently launched The Astronaut's Cookbook: Tales, Recipes, and More, by Charles T. Bourland and Gregory L. Vogt, I was curious to see what it might have to say about them. 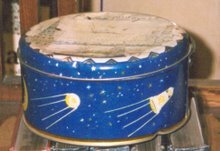 The space food stick was created by Pillsbury in a form that could be inserted into a helmet port - but of course that was never going to work with the pressure differential. Despite this, the originally caramel-flavoured sticks were part of the Apollo menu. Bourland and Vogt imply that sales of the Pillsbury space food stick were disappointing and the product never took off, so to speak (Bourland and Vogt 2010:32). This is interesting as they certainly took off in Australia! They were manufactured by White Wings, a company owned by Uncle Ben's (I think). I remember them as being chocolate, not caramel, although there was a caramel version available. In later years the box featured a picture of a BMX bike rather than a spacecraft. Perhaps there was a subtle safety message in this: "astronauts wear helmets, so it's cool to wear a bike helmet". Assuming that the callow youth thought astronauts were cool, of course. When I held a symposium about the history and heritage of Woomera a few years ago, I bought many boxes and put an individually wrapped stick in each delegate's bag of symposium stuff. A year or so later, I wanted to buy some to take to the Centre Spatial Guyanais, and was unable to find them anywhere. (Perhaps, in retrospect, the intended recipients in French Guiana may have reason to be grateful for that). 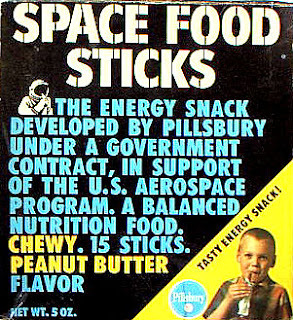 USA peanut butter flavoured space food stick box. 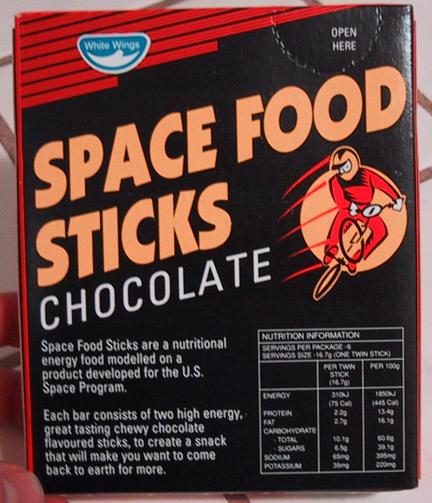 Australian chocolate space food sticks. Author's image. 4. Remove the compressed bacon and let cool. Yield: more than you would want. After samping the bar - so that you can say that you tried it - give the rest to the family dog. One nibble, and Fido will prance around the house barking [Translation: "It's BACON!"). While I don't own a hamburger press, or have a dog, I confess I am very tempted to try making some version of this. Hell - it's BACON! *Frosted cereals stay crisper longer than unfrosted cereals. 1. Put all the ingredients in the bag. 2. When ready to eat, add water and reseal the bag. 3. Shake the bag to dissolve the milk and sugar. 4. Open the bag and eat immediately with a spoon. 5. Write a note to yourself to never do that again unless you become an astronaut. I think this recipe may reflect the US palate, much sweeter than the Australian, as I can't imagine any adult would actually add sugar to an already frosted cereal, let alone 2 teaspoons. But perhaps things have to be sweeter in space. (Hmmm. This might not be too bad with Froot Loops ......). If you want to try this one, I think the first step should read "Put all the ingredients in the bag EXCEPT the water". There is an art to writing recipes that is often overlooked. Or perhaps I mean a logic. This was written as part of a book chapter, but as it developed Venus became increasingly irrelevant, so I took it out. I've been meaning to do something with it ever since. Posting it here might remind me! Although Venus is a close neighbour, and had been the subject of speculation and study since ancient times, very little was known about it in the late 1950s due to the impenetrable cloud layers above the surface (Burgess 1985:8-9). Exploring Venus would be a scientific first as it was considered to be critical in understanding the evolution of the Earth (Dorfman and Meredith 1980:773). Our “twin sister” (Marchal 1983:269) had similar mass, gravity and volume. Before the first missions, Venus also held the promise of life …. Speculations ranged from a warm, swampy world that resembled Palaeozoic Earth, dry dusty mountains, oceans of carbonic acid, a surface covered in hot oil or puddles of molten metals (Burgess 1985:13, 131). C. S. Lewis (1943) created a lyrical sensorium of fragrant floating islands, a new Eden; Isaac Asimov (1954) imagined telepathic frogs swimming Venus’ warm oceans. But when the first missions returned data, the dream of Venusian life was dashed. The earliest missions were flybys. 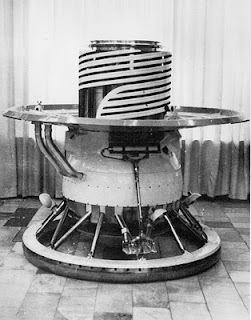 Venera 1 (USSR), launched 1961, failed to return data and entered a heliocentric orbit. In 1962, the US Mariner 2 flyby of Venus discovered that the surface temperature was likely around 430° C (Burgess 1985:2). Venera 2, launched in 1965, also failed. Venera 3 was a landing mission: the spacecraft crashed on the surface but also did not return data (Burgess 1985:22; Figure 1). Venera 4, which reached Venus in 1967, was the largest interplanetary spacecraft yet launched at 1100 kg (Burgess 1985:22). It had a more sophisticated heat shield, developed from experience with re-entry studies on ICBM warheads (Burgess 1985:38). Venera 5 and Venera 6 (1969; Figure 5) were even heavier, and designed to resist up to 27 atmospheres (atm): but it seemed that the Soviet designers were reluctant to accept the estimation of a surface pressure of around 100 atm. Both spacecraft were crushed before they reached the ground (Burgess 1985:40). Venera 7, in 1970, was the first to land intact and return data from the surface (Basilevsky et al 2007:2097). This time the landing capsule was designed to resist 180 atm, had stronger insulation and a titanium pressure sphere core (Pauken et al 2006:2). 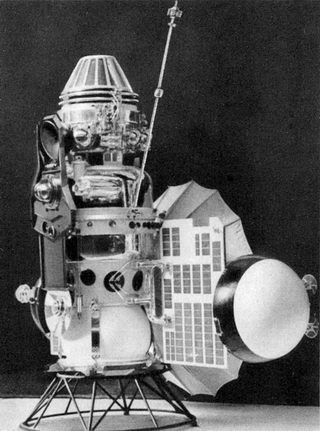 Finally, the surface temperature and pressure were confirmed, and Venera 8, launched 1972, was designed to withstand only 105 atm (Burgess 1985:43). Veneras 9 and 10, in 1975, were redesigned with a circular ring shock absorber. They returned the first pictures of the surface. In these extraordinary images, we see a field of flat rocks, with curve of the shock absorber visible on the lower edge. The perspective, as if a person is looking down on their feet, gives the photographs a personal feeling. The Veneras, in appearance, are not unlike the cyborg Daleks: they almost seem as if they could start moving of their own volition, uttering some staccato imperative (Figure 2). The images give a sense of the spacecraft orphaned on a strange planet. In 1978, both the US and USSR sent missions to Venus. Veneras 11 and 12 weighed in at 5000 kg each (Burgess 1985:48). Pioneer Venus has been the only US program to place material on the surface of Venus. Arriving at Venus in 1978, a bus delivered one large (called Large), and three small probes to the surface: the engagingly named North, Day and Night for their proposed destinations. The large probe was 1.5 m in diameter; the three small ones were 0.8 m. Each had a payload of scientific instruments. The spacecraft were designed and developed by the Hughes Aircraft Company. The large probe was a pressure vessel module 73 cm in diameter and a deceleration module weighing 317 kg. The heat shield was carbon phenolic with aluminium and fibreglass fittings. The pressure module containing the instrumentation was a titanium shell with ports and four sapphire and one diamond window for the instruments. Internal shelves were made of beryllium (Dorfman and Meredith 1980). The small probes were also titanium pressure modules with carbon phenolic heat shields, internal beryllium shelves and two diamond windows each. The Large probe jettisoned its heat shield on the way down to the surface; the small probes retained theirs (Burgess 1985:82). The last human artefacts to land on Venus were the Vega 1 and Vega 2 probes, released by rockets on their way to a rendezvous with Halley’s Comet. They were essentially developments on the basic Venera lander type. Launched in 1984, both Vegas successfully landed on Venus in 1985 and returned data. All subsequent missions have been flybys or orbiters. 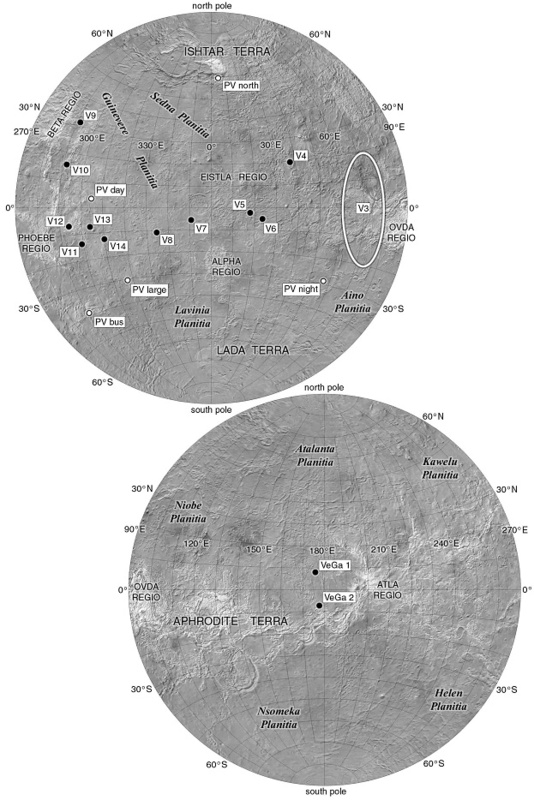 Table 1 shows the all the Venus missions which have left material on the surface of Venus. The data returned by the Venera, Pioneer Venus and other missions revealed a fierce environment with the most corrosive upper atmosphere in the solar system: Venus’ yellow clouds are concentrated sulphuric acid (Reddy and Walz-Chojnacki 2002:36-37). On the surface, pressure from the predominantly CO2 atmosphere is 90 times that on Earth; Veneras 3-6 were crushed as they descended through the atmosphere. The surface temperature is 430° C (740 K), above the melting points of lead, tin and zinc. In such conditions, is it possible that the landers and probes have survived? There is no evidence of plate tectonics and only “modest” evidence of geological activity on Venus (Jones 2007:169). Erosion processes are slow, as there is no water, and surface winds move at human walking pace (Saunders 1999:100, 108, Jones 2007:343). While the winds can move sand and dust, “the slow speed makes the particles ineffective as cutting tools and agents of erosion (Saunders 1999:108), so much so that craters a few million years in age appear fresh (Jones 2007: 275, Saunders 1999:100). There is also little danger from the upper atmosphere. The cloud layers start at around 45 km from the surface. Droplets of sulphuric acid do leak downwards, but evaporate as the temperature rises towards the surface – they do not survive below about 25 km (Jones 2007:342). Being on the surface would be like immersion in a hot dry ocean with slow currents of air (Burgess 1985:132). There is no reason why archaeologists of the future should not find the Veneras, the Vegas, and the Large, North, Day and Night probes exactly where they landed, the diamond and sapphire eyes gazing sightlessly at the dull brown terrain (Figure 3). The Venera and Vega spacecraft can be seen as representing the Cold War battle to imprint space with ideology (Gorman and O’Leary 2007). Burgess even conceptualised the Veneras as “Red flags on Venus”, and each Venera mission carried Soviet emblems to commemorate the landing (Burgess 1985:35-36). But they are much more than that. The spacecraft also represent an evolution and adaptation to increasingly more accurate information about the nature of the “errant twin”: each set of returned data enabled the design of spacecraft more suited to surviving Venusian conditions. Like the early Cold War launch sites, and the cloud of orbital debris surrounding the Earth, they have made Venus a cultural landscape where the interaction of the environment and human material culture have formed a new entity. 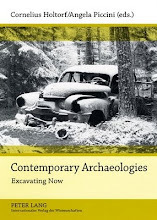 "Space age archaeology" is a term you often see applied to the technique of using satellite imagery to detect landscape patterns, and built environments, that are not apparent from aerial images or on the ground. All fine stuff. But it's not what I do. 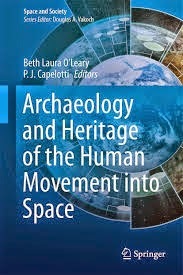 Space people, and indeed many other people, leap to the assumption that space archaeology means the use of remote sensing in terrestrial archaeology, or the study of re-entered material (ie bits of spacecraft that survive reentry to fall to the surface of the earth). The idea that the material culture of space, both in space and on Earth, is worthy of research, often takes some time to make sense to those who have not come across it before. And that's OK. It's just that I am totally over remote sensing. I have been planning to write a manifesto for a while, but manifestos require more sustained thought that can be mustered in the overworked brain of a university lecturer. Perhaps on my sabbatical next year. In the meantime, I have been contemplating the appropriate pithy quote with which to open such a work. (These things are important). I feel it ought to come from another manifesto. Manifestos are often not a ripping read, by their very nature, but there are exceptions. My all-time favourite would have to be Tristan Tzara's Dada manifestos. As far as I'm concerned, Dada was over far too soon. So, reading through Tzara's Seven Dada Manifestos and Lampisteries, I came across many that might do. I offer a few here to see what you think. I always speak about myself because I don't want to convince, and I have no right to drag others in my wake, I'm not compelling anyone to follow me, because everyone makes his art in his own way, if he knows anything about the joy that rises like an arrow up to the astral strata, or that which descends into the mines strewn with the flowers of corpses and fertile spasms. Admittedly, these do not lend themselves obviously to my purpose, but sometimes trying to see the relevance in something you like leads to new connections. This is certainly what I found when writing a talk (which I really must write into a paper) about archaeology, space and Edwin Abbott's Flatland. In the last quote, I like the sequence of memory, archaeology, prophecy, future. Tzara, Tristan 1984  Seven Dada Manifestos and Lampisteries. London: John Calder and New York: Riverrun Press. Translated by Barbara Wright. ATK Proposes Satellite That Could Break Up Space Debris. Space News (8/9, Werner, subscription required) reported, "Alliant Techsystems (ATK) is proposing plans for a small satellite designed to address one of the most vexing problems facing spacecraft operators in low Earth orbit: debris too small to be tracked by ground-based telescopes but large enough to penetrate satellite shielding." The plans are expected to be "discussed publicly" at the American Institute of Aeronautics and Astronautics small satellite conference on Wednesday. "The spacecraft would operate in low Earth orbit as a sweeper or shield, breaking up debris particles and reducing their velocity, according to Jose Guerrero, chief technologist for ATK Spacecraft Division's Systems and Advanced Technology Group." The concept has been discussed with NASA, DARPA, and the US Air Force, "Guerrero said. Further development of the concept, including testing, will require government funding, he added." This is recent data released by NASA's Orbital Debris Office. As a result of over 4 700 launches since 1957, there are currently around 19 000 pieces of trackable debris. Most of this derives from missions launched by the USA, the former USSR and China. What's interesting to note about this is that the most frequent source of debris in the top ten is rocket bodies, and I presume this is largely due to residual fuel (there is a large amount of literature on the problem of passivation at the end of mission life). And six are also within the last ten years, suggesting that, despite guidelines for limiting the creation of orbital debris being around for a decade or more, they may not be very effective ...... Note also that there are only two accidental collisions in this list, which supports my argument that the risks posed by large objects that may have heritage value, if they are left in orbit, are not as great as we might think. Of course this is only the top ten, and a more thorough investigation of the figures may be illuminating. Terrified that some technical glitch will cause all of Space Age Archaeology to disappear as if it had never been? (I know I am). Wondering how future generations will learn about space archaeology when blogs are as antiquated as cuneiform? Well worry no more! PANDORA, Australia's Web Archive, is a growing collection of Australian online publications, established initially by the National Library of Australia in 1996, and now built in collaboration with nine other Australian libraries and cultural collecting organisations. 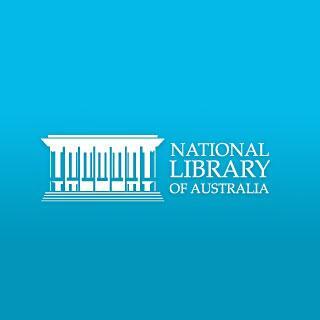 The name, PANDORA, is an acronym that encapsulates our mission: Preserving and Accessing Networked Documentary Resources of Australia. This is, I like to feel, something of an accolade. Last week I attended the ceremony at Tidbinbilla to celebrate the inscription of the three ACT tracking stations, Tidbinbilla, Orroral Valley and Honeysuckle Creek, on the AIAA Historic Aerospace Sites register. Caught up with the darling Gordon Pike (SingTel Optus), with whom I discussed the relative advantages of spin stabilisation and three-axis stabilisation. He also told me about Optus' tracking station at Frenchs Forest in Sydney (aha!). I had some fascinating chats with former tracking station staff - of that more soon. Orbital debris guru Duncan Steel (QinetiQ) was there, as well as Ian Tuohy of BAE Systems, taking a brief respite from gearing up for Hayabusa's return. Michael West, chair of the AIAA Sydney Section, gave me a lift there and back (Tidbinbilla is about half an hour out of Canberra). A truly wonderful occasion. The Galaxy 15 commercial satellite that recently lost contact with the ground has joined the ranks of a boatload of other debris adrift in space. It's now termed a "zombiesat" by engineers who have a better sense of humor than you might have imagined. So what's next for this 4,171-pound (1,892-kg) zombiesat? This defunct satellite will probably drift to one of two "gravity wells" that catch most out-of-control spacecraft, experts say. Galaxy 15 could threaten nearby satellites because its communications package is stuck on and it may start interfering with its neighbors by siphoning off their signals. It's the first time such an event has ever occurred, and it sent Orbital Sciences, the satellite's builder, on a dash to figure out how to stop the satellite-run-amok. Galaxy 15, like many communications satellites, was circling Earth about 22,369 miles (36,000 km) high in what's called geosynchronous orbit, meaning that it orbited at the same speed the Earth rotates, so that it sat perched above the same part of Earth all the time. "There are two points in geosynchronous orbit called geopotential wells," explained Nicholas Johnson, chief scientist for Orbital Debris at NASA's Johnson Space Center in Houston. "These are perturbations in Earth's gravity field. Typically when satellites lose control they will drift toward the nearest geopotential well and just oscillate around it." The two spots, also called libration points, are located at longitudes of 105 degrees west and 75 degrees east. There are already between 150 and 200 objects oscillating around these points, Johnson said. In that sense, the new zombiesat doesn't significantly increase the space debris problem or pose a serious risk of colliding with an operational satellite. "Space is still a very large place," Johnson told SPACE.com. "There are a lot of objects that are drifting back and forth. Galaxy 15 really just kind of joins a relatively large number of objects – it's not a significant new hazard from a global standpoint. But if your satellite happens to be near where Galaxy 15 is drifting then it's of more concern." Eventually, everything in low-Earth orbit will eventually fall back down toward Earth because of atmospheric drag. The small amount of atmospheric particles in space create friction with spacecraft, causing their orbits to decay. The time it takes for an object's orbit to decay depends on its altitude. For example, the International Space Station orbits at about 250 miles (400 kilometers) above Earth, while the Hubble Space Telescope circles much higher, at 353 miles (569 km). "When things fall off the International Space Station, they typically fall back within a couple months, but where Hubble is, it typically takes several years to fall back to Earth," Johnson said. "At 800 km you're talking many decades or even hundreds of years." To prevent the buildup of dead spacecraft in heavily trafficked areas of geosynchronous orbit, guidelines recommend that when a satellite reaches the end of its life it is boosted to a higher orbit out of the way. This "graveyard orbit" is about 186 miles (300 km) above where most satellites orbit. "The whole idea is to get to an altitude so they don't drift back into the operational region for a very, very long time – over 100 years," Johnson said. It's actually easier to boost a spacecraft up just this much higher than to maneuver a craft down to where it would immediately fall back to Earth and burn up in the atmosphere, he said. To actually go and collect defunct spacecraft to remove the collision risk altogether is currently beyond our ability. "Unfortunately we haven't found a concept which appears to be both technically feasible and affordable," Johnson said. 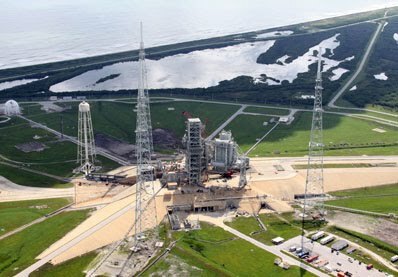 The best way to remove spent rocket stages and other large objects from orbit is to simply send up another spacecraft to rendezvous and dock with it and drag it back down to earth. This method would be extremely expensive and time-consuming, and isn't viable for the vast number of objects already in space. Some more exotic measures involving tethers and other props have been proposed, Johnson said, but aren't yet feasible. For getting rid of very small pieces of space junk, there are two favorite ideas, he said. One involves shooting lasers at the objects to push them into lower-altitude orbits so they fall back down to Earth more quickly. "That has technical, economic, as well as policy issues," Johnson said. Another concept is to fly up a structure with a large area but low mass so that when particles strike the surface they will penetrate and lose some of their orbital energy, causing them to fall back to Earth more quickly. This option would also need many technical issues ironed out. "If it was easy we'd already be doing it," Johnson said of tackling the debris problem. "But it's prudent to be working the issue now before it becomes a serious impediment to space operations."